One of the latest American scandals revolves around former National Security Advisor Michael Flynn’s alleged breach of ethical norms in trying to secretly push through a nuclear energy deal with the Saudis which might have even been illegal if he tried to circumvent the so-called “123 agreement”, though his partnered company at the time hit back against these accusations and the claims that this represented a conflict of interest by defending their actions as necessary for the US to compete with Russia. The Democratic-controlled House of Representatives just opened an investigation into whether former National Security Advisor Michael Flynn breached ethical norms by trying to secretly push through a nuclear energy deal with the Saudis, one that might have also been illegal if he tried to circumvent the so-called “123 agreement” that entails safety guarantees and prevents the recipient state from abusing this technology to potentially develop nuclear weapons. Critics are also decrying the optics of an obvious conflict of interest after it was revealed that he was an advisor for a subsidiary of the IP3 International company that ended up officially making the proposal during the first weeks of Trump’s Presidency while Flynn was still with the Administration, though the company defended its actions by saying that everything it did was within the law and designed to help the US compete with Russia in the Kingdom. Evidently it was, or at least enough to convince Rosatom to announce a month afterwards in November 2017 that it wants to take part in a bid to construct 16 nuclear reactors in the Kingdom, a full 15 more than Russia built in nearby Iran. While no tangible work has been undertaken in this respect thus far, that doesn’t mean that Russian-Saudi ties haven’t continued to improve in the intervening period. The Khashoggi scandal saw Saudi Arabia’s former Western “partners” team up against it in an effort to put multilateral pressure on the country and “isolate” it, which failed because of Russia’s refusal to jump on the bandwagon. That’s why the author remarked last fall that “It Turns Out That Saudi Arabia Isn’t Exactly An American Puppet After All”, which was confirmed by President Putin and Crown Prince Mohammed Bin Salman (MBS) famously sharing a brotherly handshake at the G20 in defiance of the West. 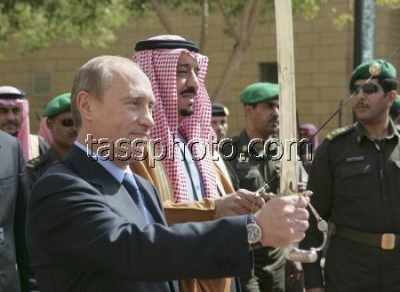 With the world having seen the writing on the wall over a decade ago that Russian-Saudi relations were increasingly taking on the strategic nature that they’d later unquestionably embody almost a year after Trump’s election following the Saudi King’s visit to Moscow, it’s little wonder that IP3 International realized that it would have to act fast through Flynn if the US wanted to stand any chance of competing with Russia in the Kingdom, ergo the ongoing scandal over the former National Security Advisor’s alleged promotion of his partner’s nuclear energy deal. That’s not to say that anything illegal transpired, but just that there was veritably a sense of urgency to push through the proposal in order to not lose out to the Russians, so it’s conceivable that some ethical corners might have been cut along the way. About those, there’s nothing new about potential conflicts of interest occurring in the US or anywhere else in the world for that matter, and it’s an illusion to believe that nuclear energy deals are always concluded after a period of truly competitive bidding results in the recipient state making a strictly independent decision on which country to partner with. That said, it does appear as though IP3 International skirted the US’ “official ethical norms” by more than likely using Flynn as their “deep state” lobbyist for promoting their plans, which they justified in the interests of competing with Russia. Seeing as how US-Saudi ties have only gotten worse in the past two years while Russian-Saudi ones have unprecedentedly improved to their best-ever point in history, it can be said that this risky gambit failed and now Flynn might be forced to pay the consequences.